Old Hollywood movie poster of one of the biggest blockbuster series to be ever made in the history of cinema, The Godfather Part II for sale. 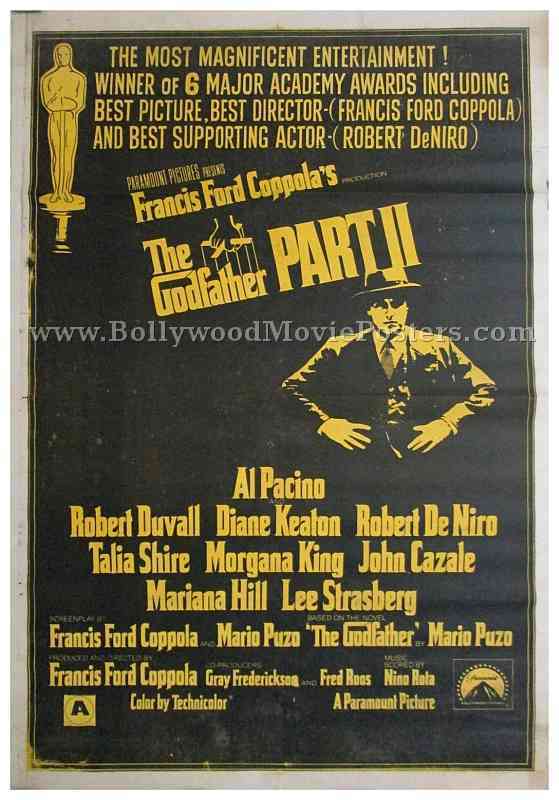 Featured here for sale is an actual surviving original Hollywood movie poster of The Godfather Part II. Printed in India during the local release of the film somewhere in the 1980s, this 1972 Godfather movie poster was originally intended for publicity of the film but never ended up being used. The Godfather Part II was nominated for eleven Academy Awards. It was the first sequel to win an Oscar for Best Picture. In total, the film bagged six Oscars including Best Director and Best Supporting Actor. Al Pacino won the BAFTA Award for Best Actor and was nominated for the Academy Award for Best Actor for his fine performance in The Godfather Part II. The Godfather Part II is widely regarded as one of the greatest gangster films ever made in Hollywood, making this poster highly collectible! 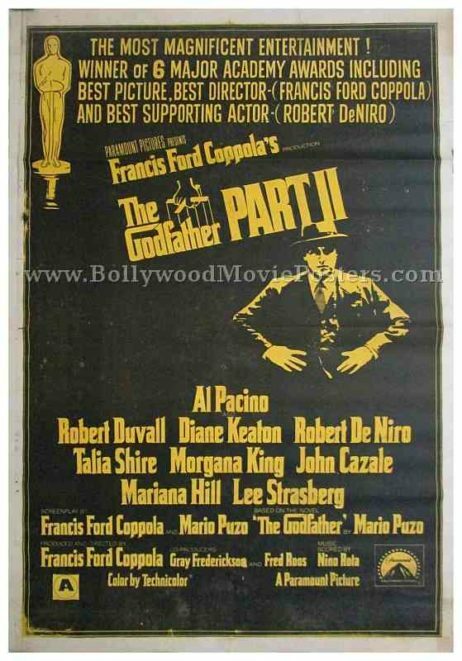 This original Godfather movie poster for sale capitalizes on the success of the film at the Oscars by announcing the same in prominent letters on the top. The Godfather Part II is a 1974 American crime drama partially based on Mario Puzo’s 1969 novel by the same name. The film stars two of the greatest names in Hollywood, Al Pacino and Robert De Niro. The Godfather Part II is the second installment of the three part series of The Godfather, which traces the story of Michael Corleone (played by Al Pacino), the new Don of the Corleone crime family. The third and final installment in the series, The Godfather Part III was released in 1990. Old Hollywood movie stills of the cult classic, The Godfather Part III (1990) for sale. This is an actual surviving original set of lobby cards of the 1990 film which was the third and final installment in the cult crime drama series, The Godfather. The Godfather Part III was nominated for seven Academy Awards including the Academy Award for Best Picture, making this lobby card set highly collectible! Printed and circulated during the first release of the film in India (1990s), this set of old Hollywood movie stills was printed for publicity of the film inside a cinema hall. Featured here for sale is a set of 8 different still photos of the cult crime drama, The Godfather Part III! 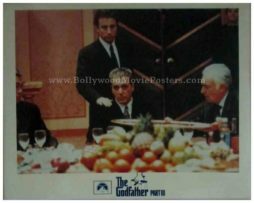 These old still photos were printed to be used as pin ups on notice boards inside the foyer of a cinema hall in India that screened The Godfather Part III, but never ended up being used.